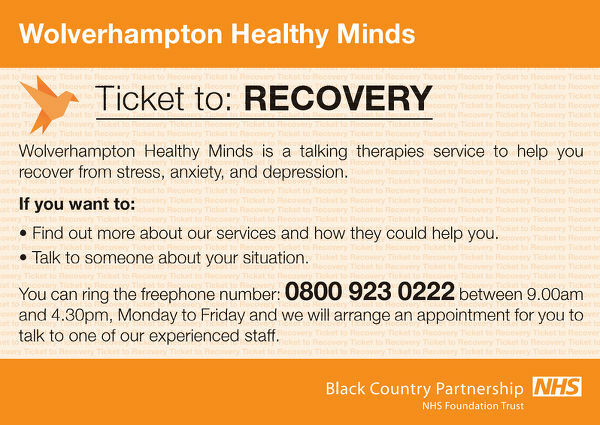 Wolverhampton Healthy Minds is a psychological therapies service for people who are experiencing common mental health problems such as depression, anxiety and stress. The are several ways to access our service. Referrals are usually made by your GP who will either give you a ‘Ticket to Recovery’ or write a referral letter. If you have been issued a ‘Ticket to Recovery’ you will be asked to make contact the service to arrange an assessment appointment which is usually carried out over the telephone by one of our Psychological Wellbeing Practitioners. If your GP has written a referral then the service will contact you to book an assessment appointment. Click to see a sample 'Ticket to Recovery'. We also have an online self-referral option, by answering some questions you can refer without having to see your GP, so if you wish to use this please click here to do so. The service does not operate an out of hours service. Crises experienced by existing clients would be directed to Wolverhampton’s Crisis Home Treatment Team or primary care services.